API restriction: The assembly ‘file:///C:Builds<path>myassembly.dll’ has already loaded from a different location. It cannot be loaded from a new location within the same appdomain. Every time I’ve got this error, the project has been a web application, and the path to the assembly points down to the _PublishedWebsites directory that is created beneath the Binaries folder during a team build. This pattern means that MSTest will search recursively for all assemblies beneath the Binaries folder, and during the search it will find the MyAssembly.dll twice. It worked for me. tnks! Thanks Jakob. Your solution solved my problem too. I had a web project named “WebTest” that contained no unit test. Thanks. It solved my problem too. Look at the tailend for possible other causes of this issue. Thanks for the post, helped quickly to resolve the issue. Thank you so much its great. Excellent explanation and great solution, Thanks. I was getting this error and the solution in your post solved it. Ahh, I had a project named ‘datatest’ that had no tests in it. Nice find. Cool.. this helped me to get through the error. 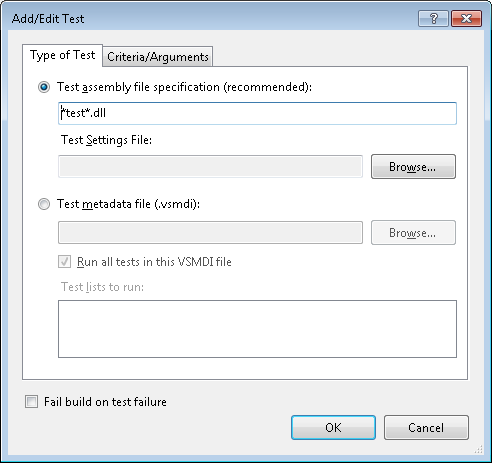 It worked for me for VS 2013 too. Thank you. I am using VS2013 and same issue with API restriction error. I cannot find project build definition. Solution Explorer shows tree of project. Is that the place to find definition ?